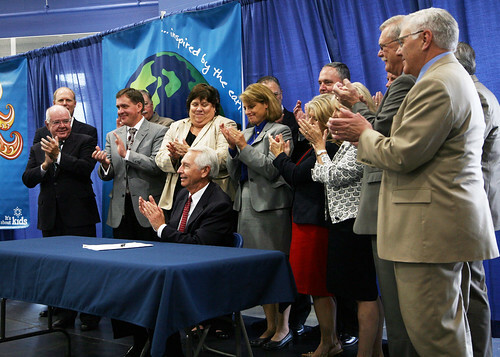 LEXINGTON, Ky. – In a move to help produce the skilled workforce businesses require today and in the future, Governor Steve Beshear today signed an executive order that will overhaul the state’s career and technical education (CTE) system. The order unites the state’s two CTE systems under the guidance of Kentucky’s Department of Education. The goal is to create a unified, more relevant and efficient system to educate and prepare students for the world of work in a real-life setting. The executive order is part of a larger effort to prepare students for a wider range of career options through high-quality CTE programs. Educators, businesses and administrators across the state are working together to make these programs more accessible earlier, more academically rigorous and better aligned with postsecondary requirements and employer needs. For example, the Kentucky Board of Education has adopted a college and career readiness measure that includes an academic component and a technical skill component. The Kentucky Community and Technical College System (KCTCS) offers dual credit opportunities so that high school students can earn college credit. Kentucky provides funds from the Carl D. Perkins CTE Basic Grant to encourage secondary and postsecondary institutions to develop innovative career pathways. In addition, the Governor’s Task Force on Transforming Education in Kentucky and the Graduate Kentucky steering committee, led by First Lady Jane Beshear, have both made recommendations to improve career and technical education opportunities and reinforce its role as a critical component of Kentucky’s college and career readiness initiative. Studies show that graduation rates are higher among students who participate in CTE programs as opposed to those who do not. These high school graduates are then more likely to transition to postsecondary education or employment. Seventy-five percent of Kentucky high school students, more than 150,000 pupils, were enrolled in career and technical education programs last year. Career and technical education – offering hands-on training in areas such as agriscience, machine tool technology, health sciences, electrical technology and business administration – is provided at 323 middle and high schools, area technology centers and career and technical centers across the state. The executive order also establishes a CTE Advisory Committee that will provide guidance in the design and implementation of programs that give all students the best possible opportunity for career preparation in a unified system. “By bringing together oversight of career and technical education at the state level we will become much more effective in delivering the training our students need and our employers expect,” said Rep. Carl Rollins, of Midway. 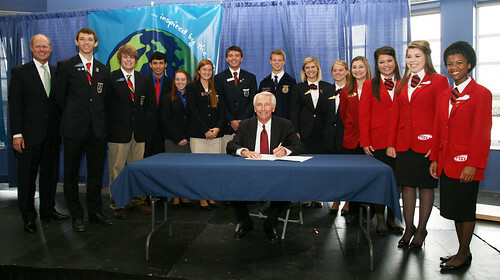 The signing ceremony was held at Lexington’s newest career and technical high school, Locust Trace Agriscience Farm. In addition to classrooms with adjoining labs, the facility features 6.5 acres for gardening, a state-of-the-art greenhouse and aquaculture area, an auditorium to accommodate livestock and machinery, an equine barn and arena and an on-site veterinary clinic. The school offers courses in plant and land science, biotechnology and environmental science, agriculture power mechanics, equine and vet science, and small and large animal science.